Aspen near Dragon's Bay, Grenada. 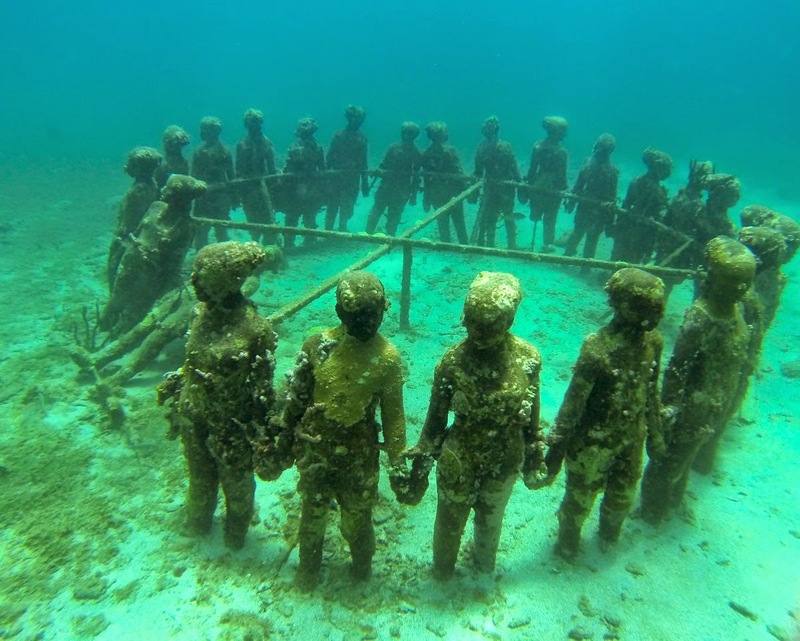 The underwater park in Grenada and the statues. 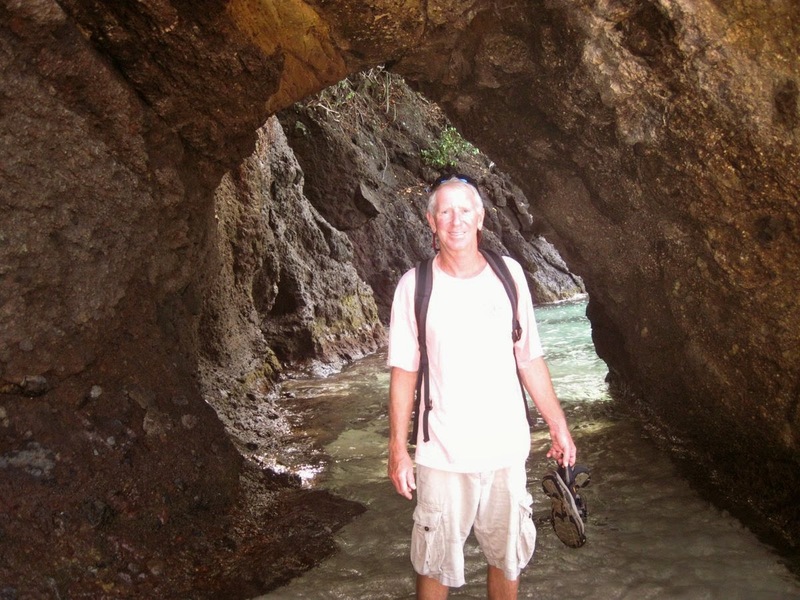 Closeup of the underwater park in Grenada - just snorkeling around. 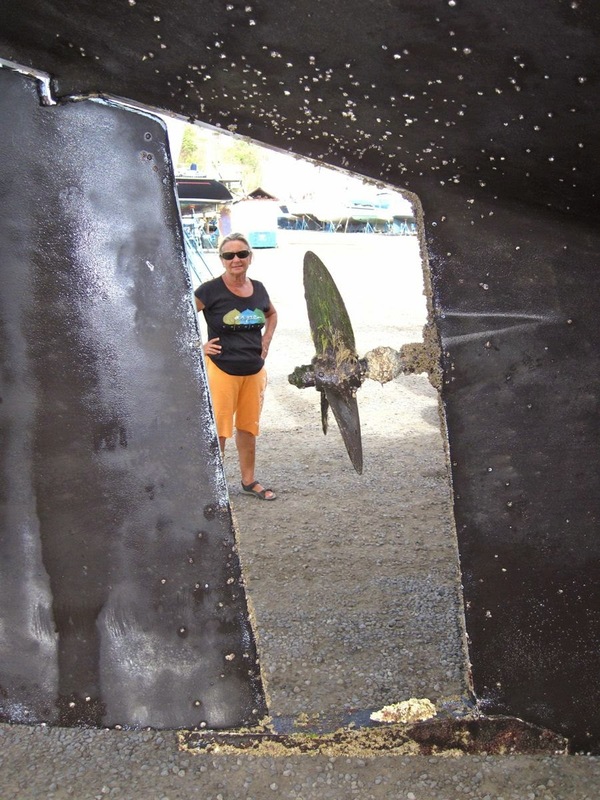 Not one of the statues - Captain Steve. 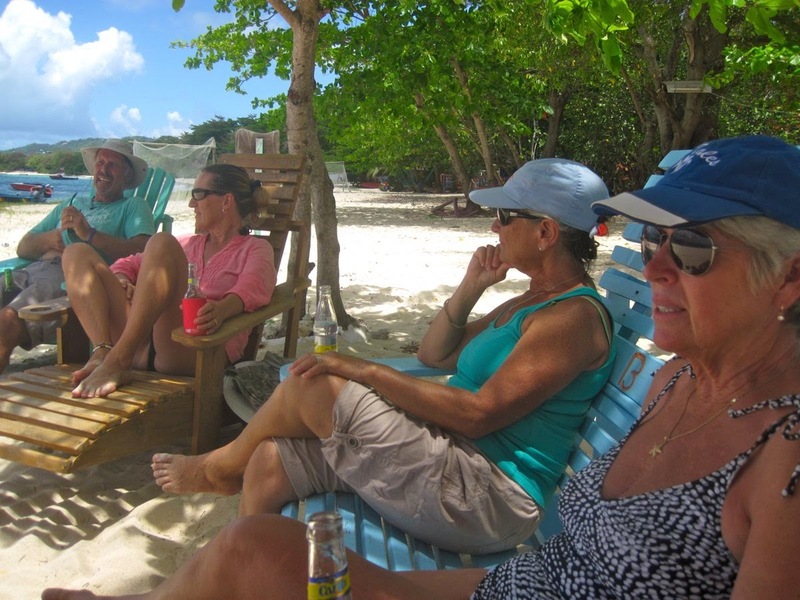 Maria, John, Alex (Free Spirit) and Dawn (Cat Tales) enjoying the beach on Carriacou. 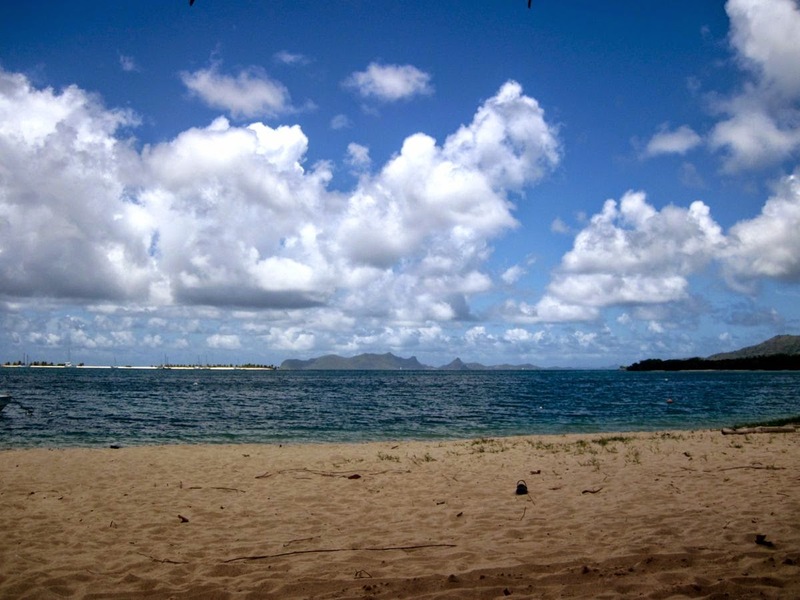 The view from Paradise Beach, Carriacou. In the distance is Union Island and the Grenadines. 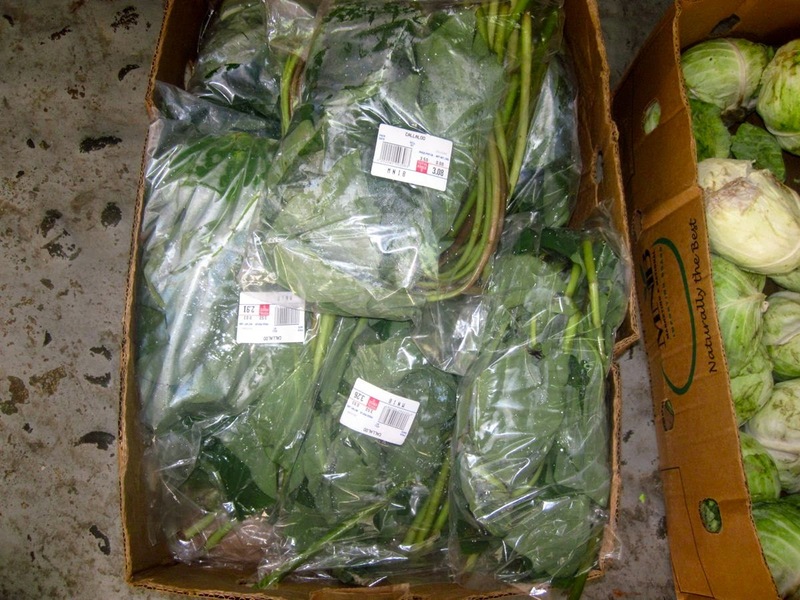 Callaloo at the veggie market - a vegetable Maria enjoys (but not Captain Steve). 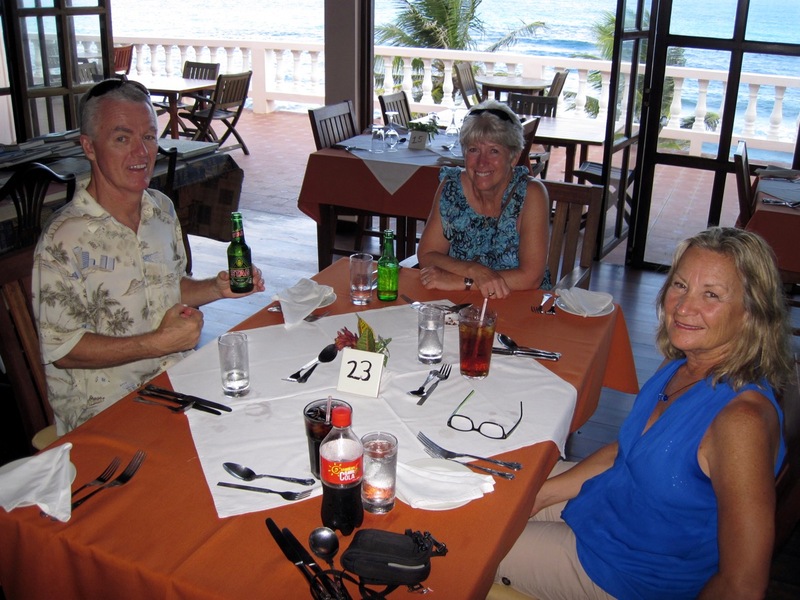 Lunch in Hillsborough, Carriacou with Dawn of Cat Tales. 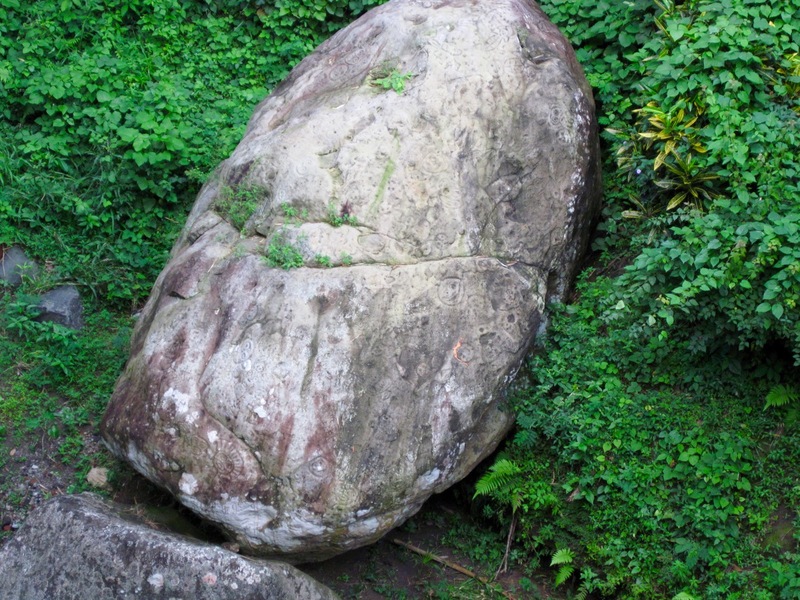 Which came first, the tree or the boulder??? 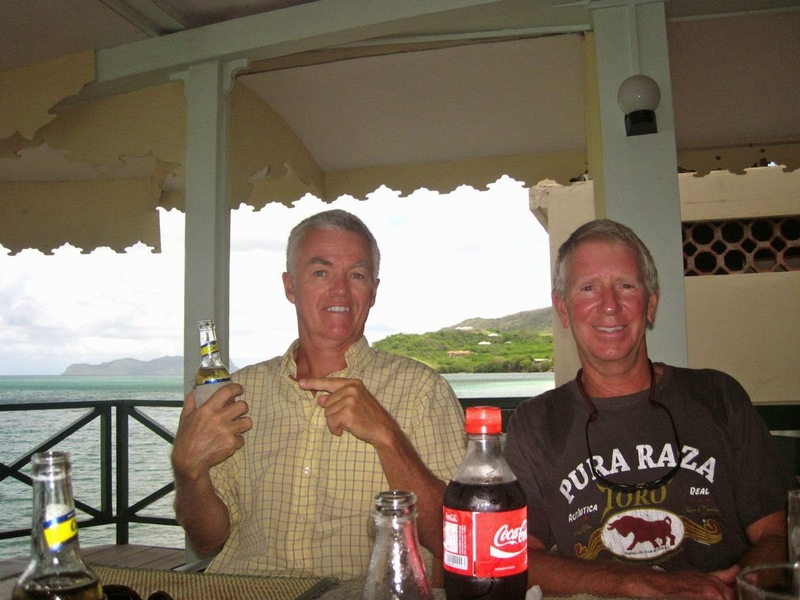 Laurie on the catamaran Cat Tales and Steve enjoying beverages in Carriacou. 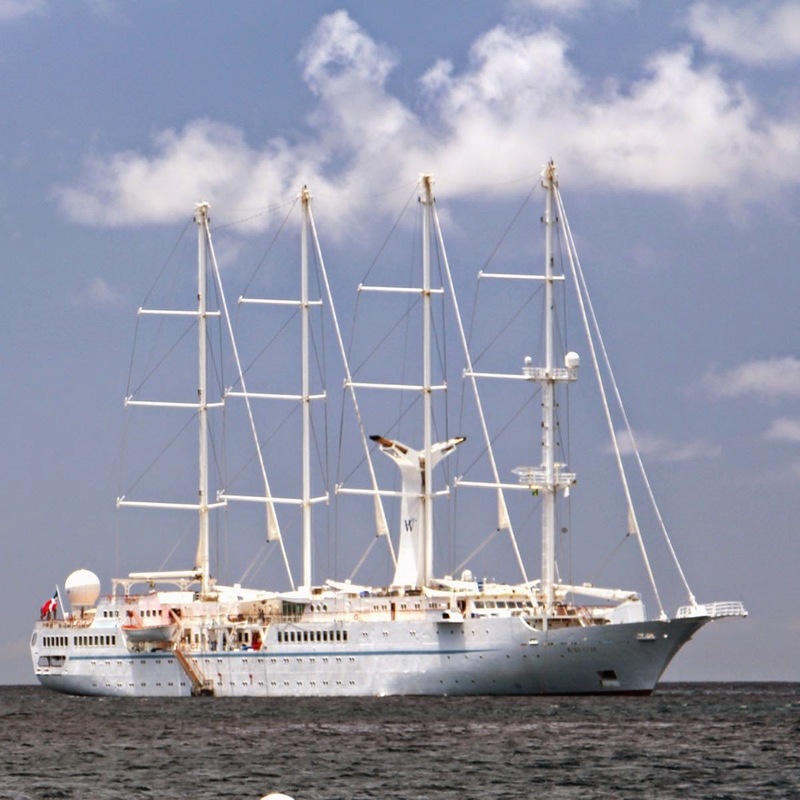 We had two of our best sails this year coming down to Grenada. There were beam winds and small seas that rocketed Aspen from Bequia all the way to Grenada. 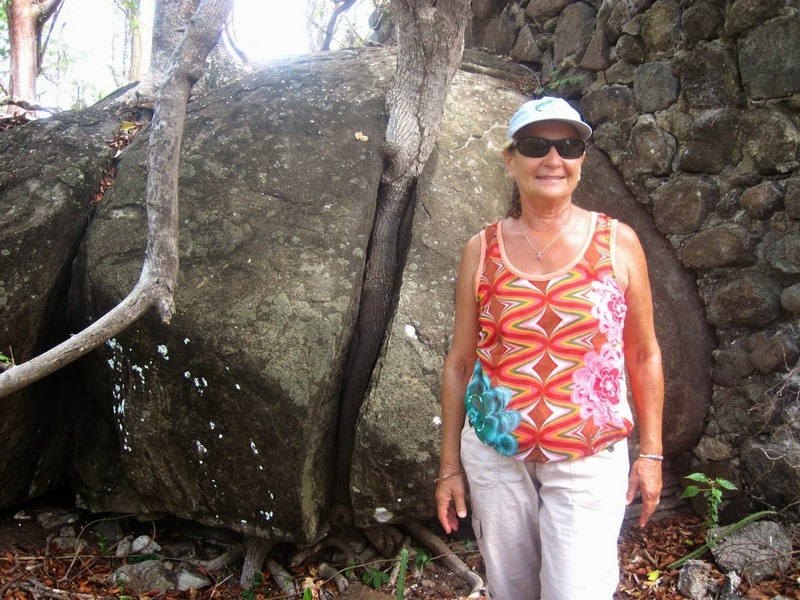 Along the way we visited Carriacou, an island that is part of Grenada but obviously left in the past. It is kind of a backwater place with little traffic and goats, sheep and cows owning a lot of the land. 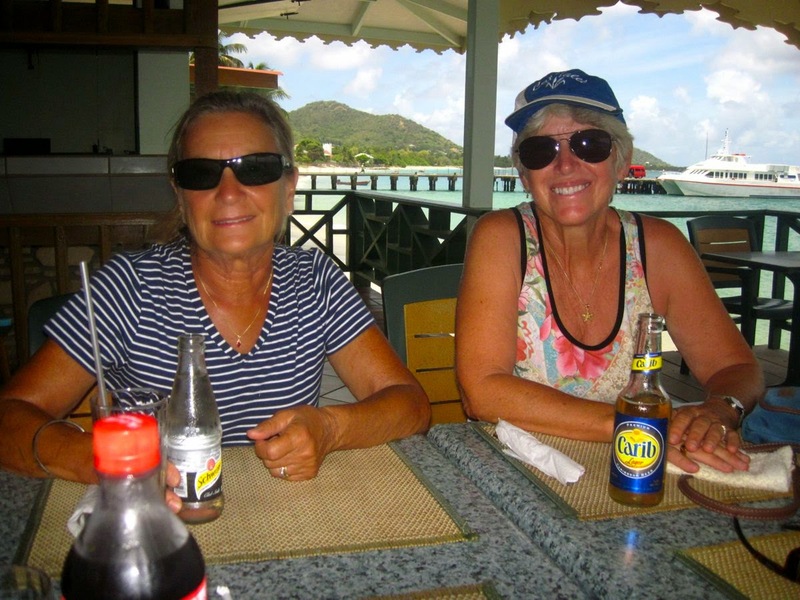 Life is slow on Carriacou but the locals are nice and friendly toward sailors. 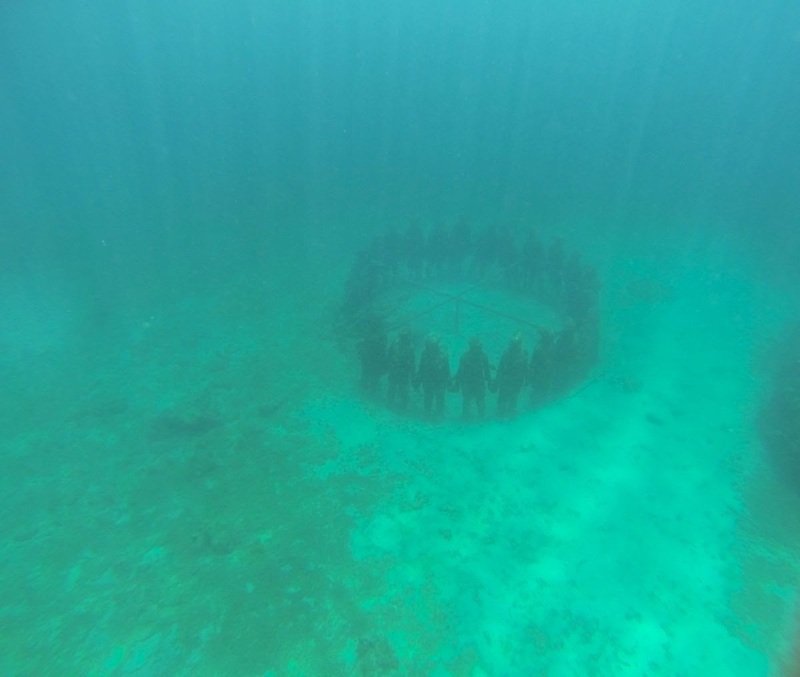 Then it was another fair wind passage to St. Georges, Grenada with a stop at the statues that comprise an underwater park for visitors to admire. Time has taken a toll on the statures but they are still nice to visit and admire in such a setting. 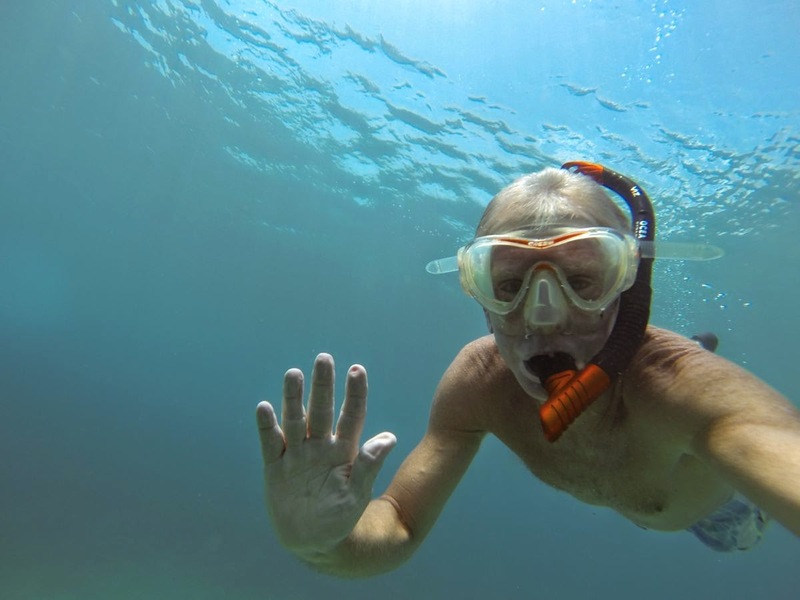 Admiral Maria decided not to join Steve during the underwater exploration but made sure Aspen stayed safe nearby. 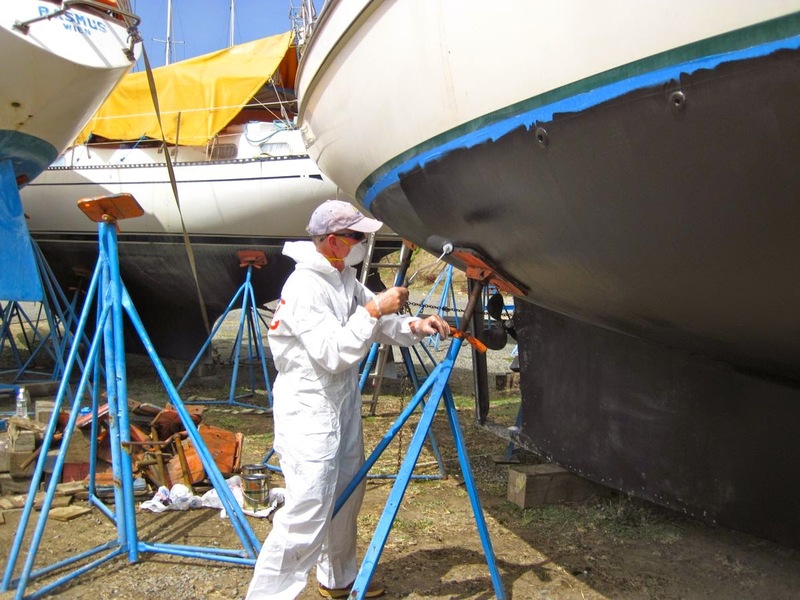 Presently we are at anchor on the east coast of Grenada at Prickly Bay, where cruisers congregate and prepare their boats for storage in the boatyard. 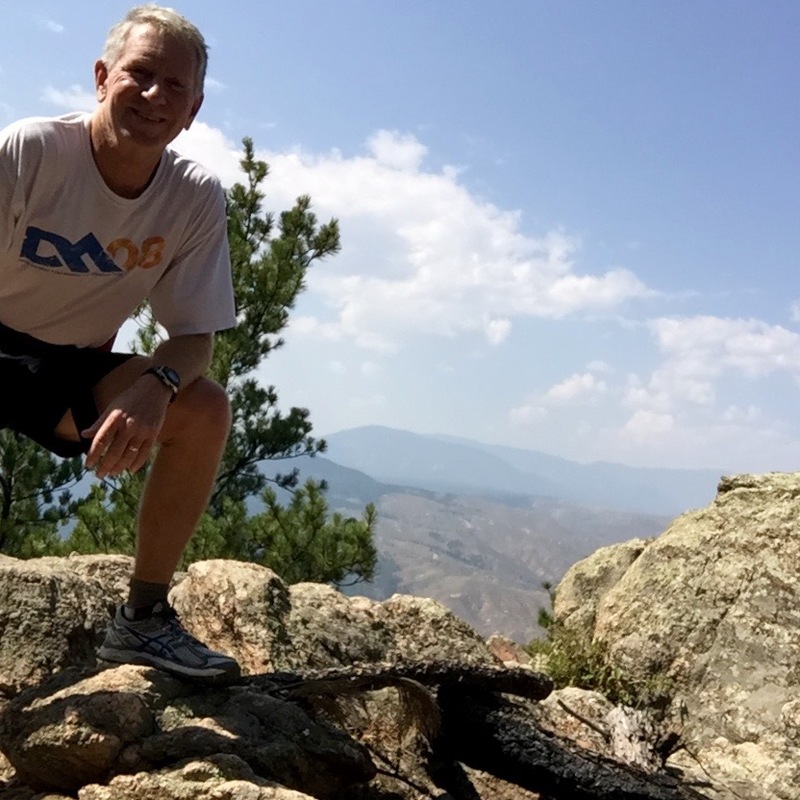 There are still happy hours, weekly hash house harrier runs and places nearby to explore. Yet there is plenty of hard work to be done before Aspen gets another rest on land. 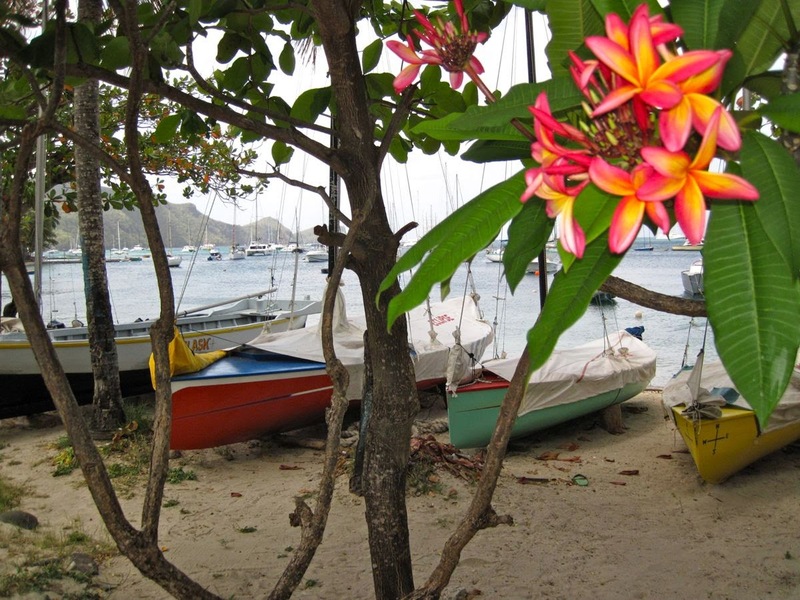 A few of the local race boats in Bequia. Don't be sittin' on dem! Maria shopping for local things at the local stands. The Windjammer Mandaley with only 2 out of her 3 masts, for some odd reason. 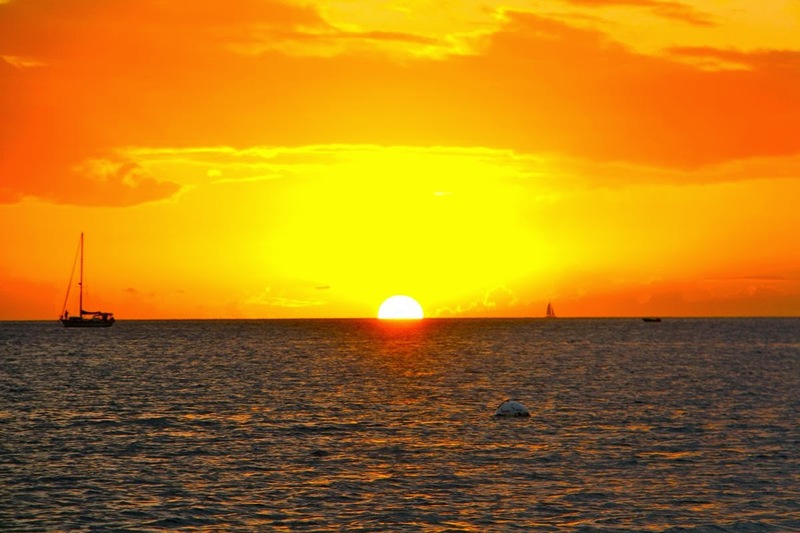 Waiting for the green flash at anchor in Bequia's Admiralty Bay. How many people can you fit in a dinghy and still float? 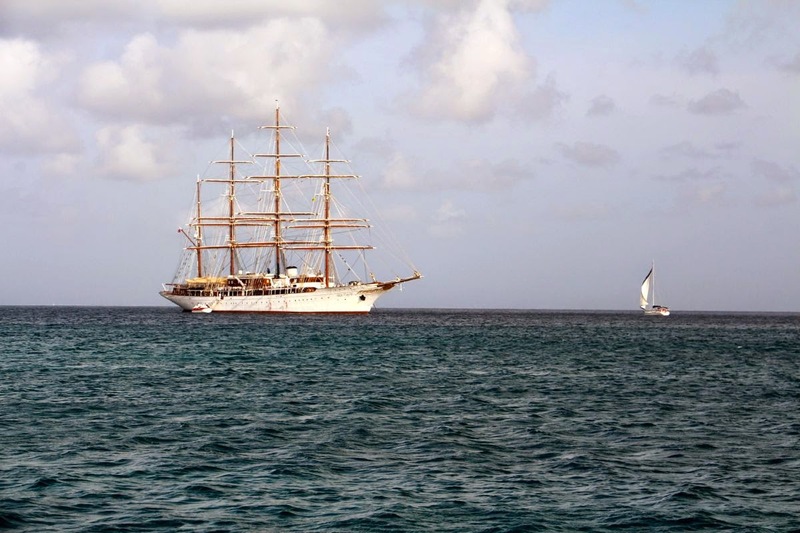 The Royal Clipper ship in Bequia. 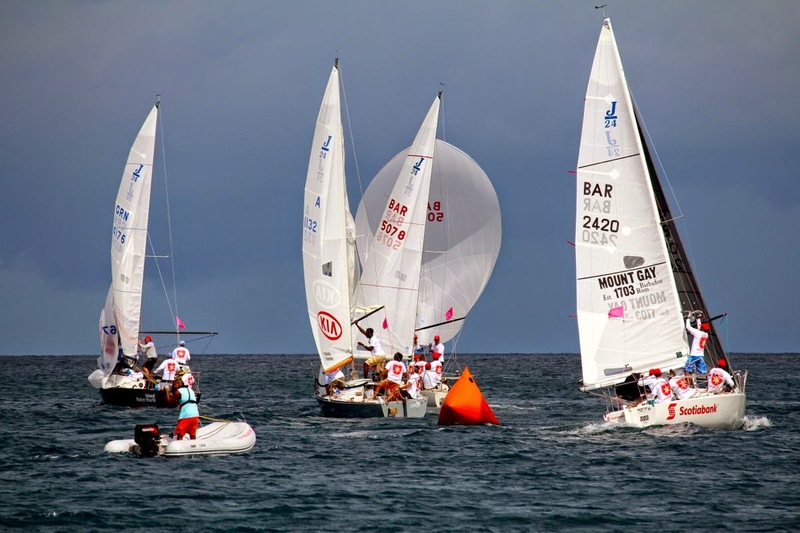 J-24 racing action in Bequia. Note the photographer in the little dinghy trying to catch the action. The view from the Fire Fly restaurant on Bequia. 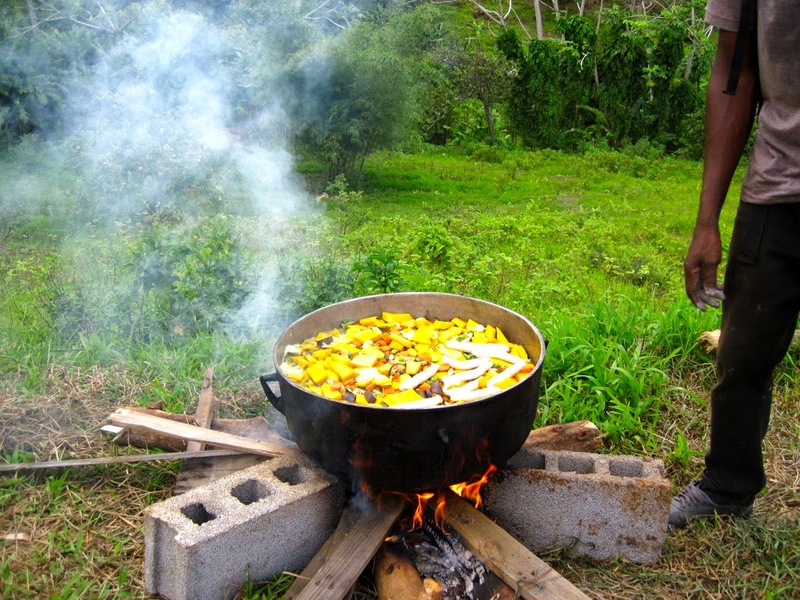 Buy lunch and you can use the fresh water pool! 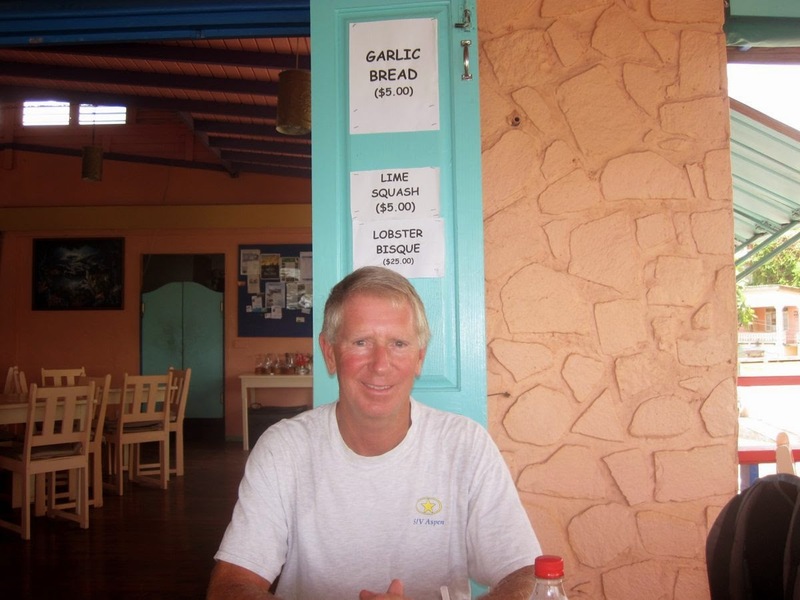 Captain Steve waiting for his lunch - you can see the menu behind him. 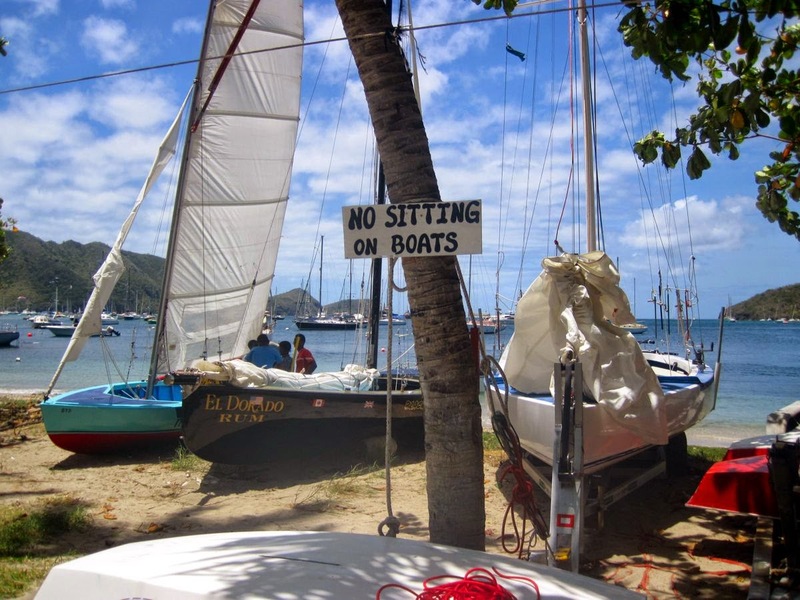 The Bequia Easter Sailing Regatta is now history. 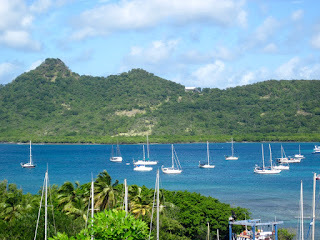 We had to stay and see all the fun that the local sailing boats provide, along with the Caribbean sailors too. Luckily Aspen was close to the marks so all we did was sit in our cockpit and watch the action. 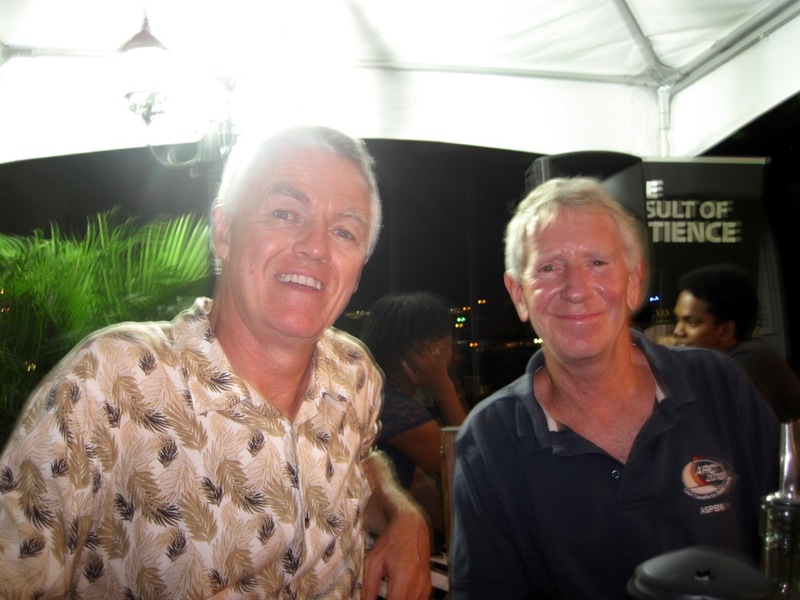 Since it was Easter weekend in Bequia, most stores were closed and the ATM machine ran out of money, as expected. Not to worry, Aspen was stocked up with essential provisions like chicken, pasta, and rum. 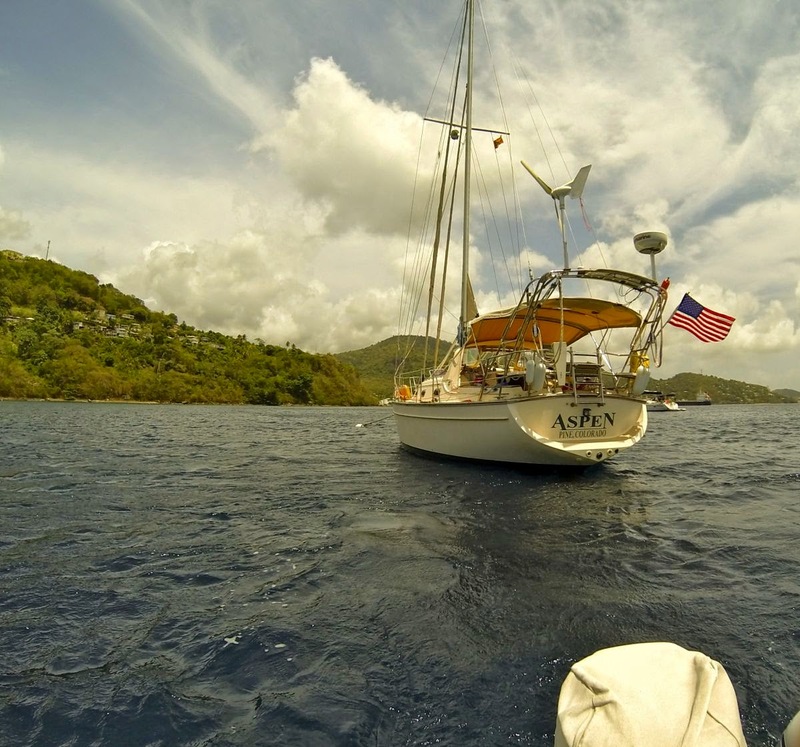 Now it is time to put the wind back in our sails and push deeper toward Grenada, our final stop this sailing season. But there are so many islands to visit before we put Aspen on land again. 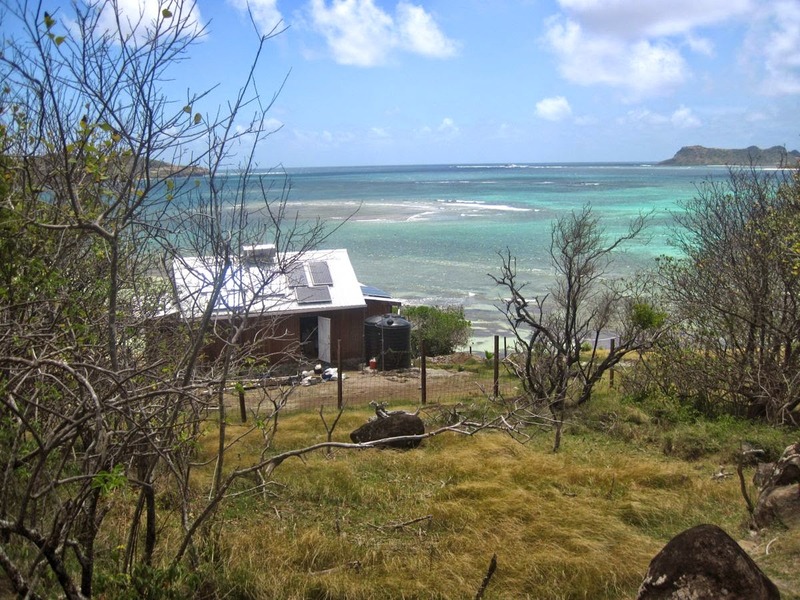 The legendary crystal clear waters of the Tobago Cays, Mayreau, Union Island and Carriacou are short sails away. 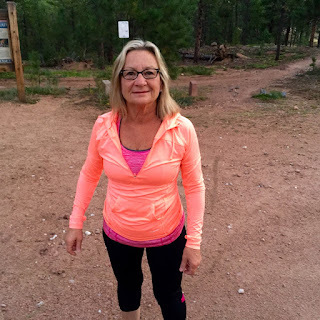 No overnight passages this year and Maria is thankful for that. Saconi playing and singing his song in Bequia for us. Nice song! 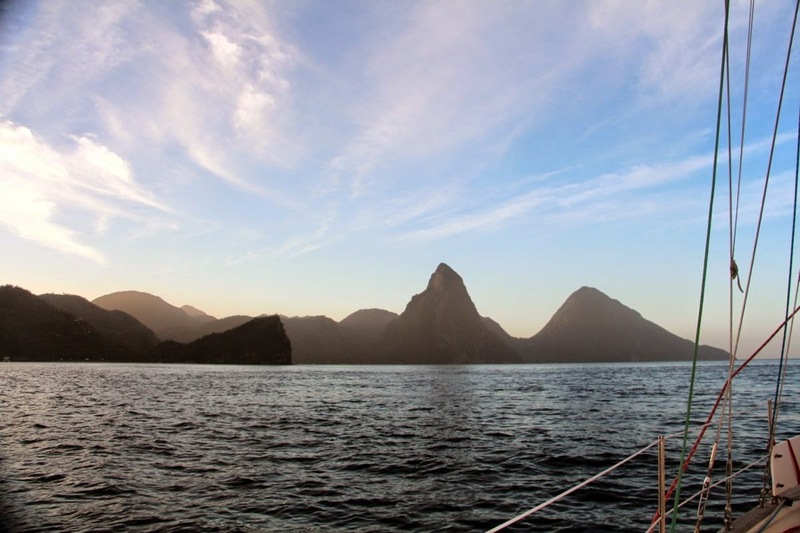 Sailing down the coast of St. Lucia with the famous Pitons close by. 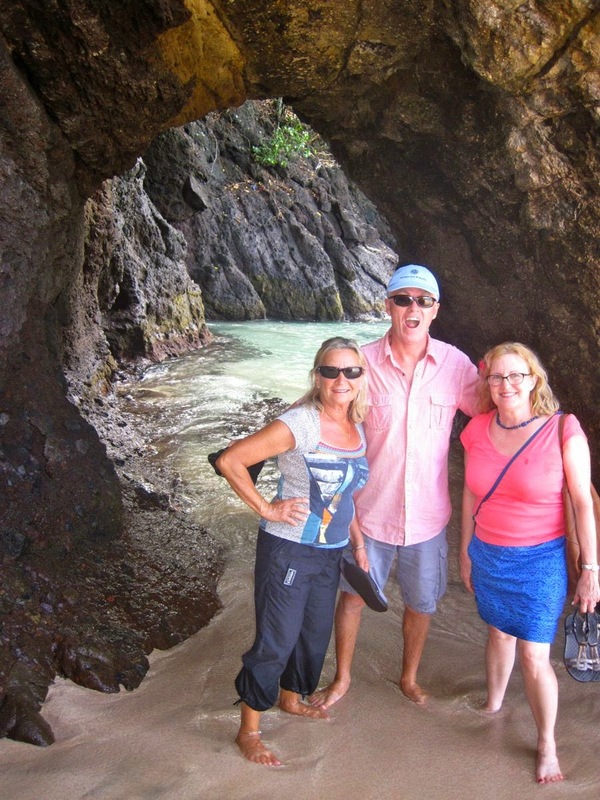 The walkway around the coast of Bequia with Maria and our friends making their way to the beach. 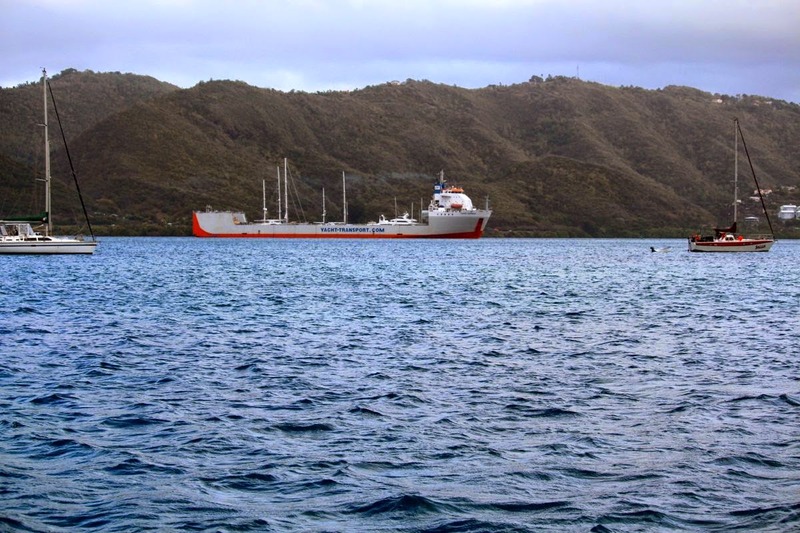 A Dockwise yacht transport ship entering the harbor in Marin, Martinique. 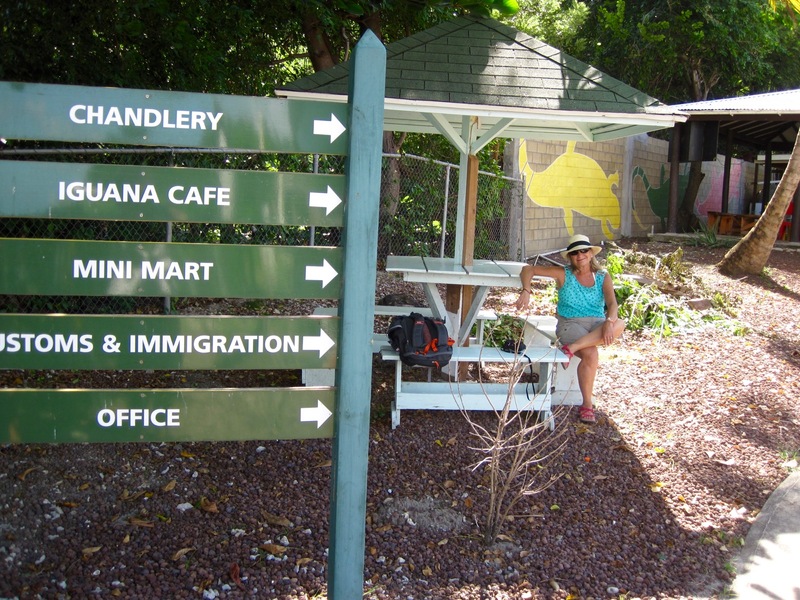 The easy way to paradise! Maria after her hair appointment in French Martinique. Her hairdresser was from Paris of course! 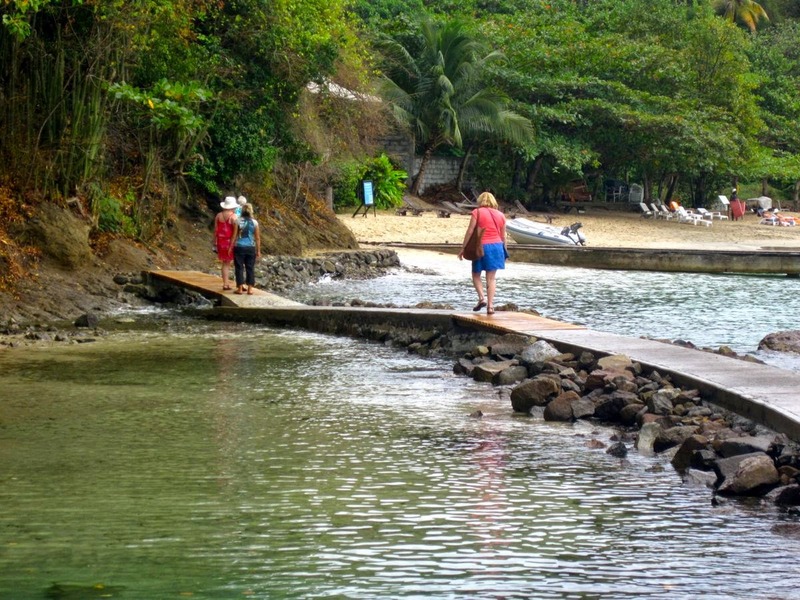 The dinghy dock in Rodney Bay, St. Lucia. 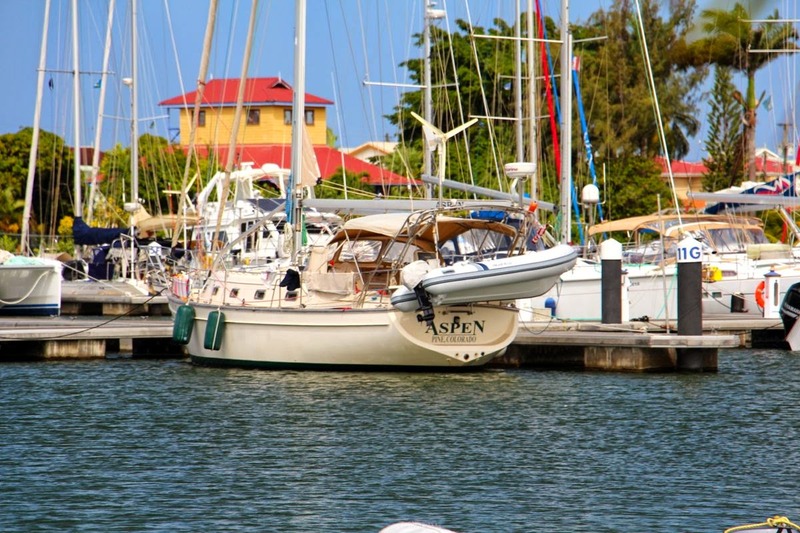 Aspen at the dock in Rodney Bay, St. Lucia. 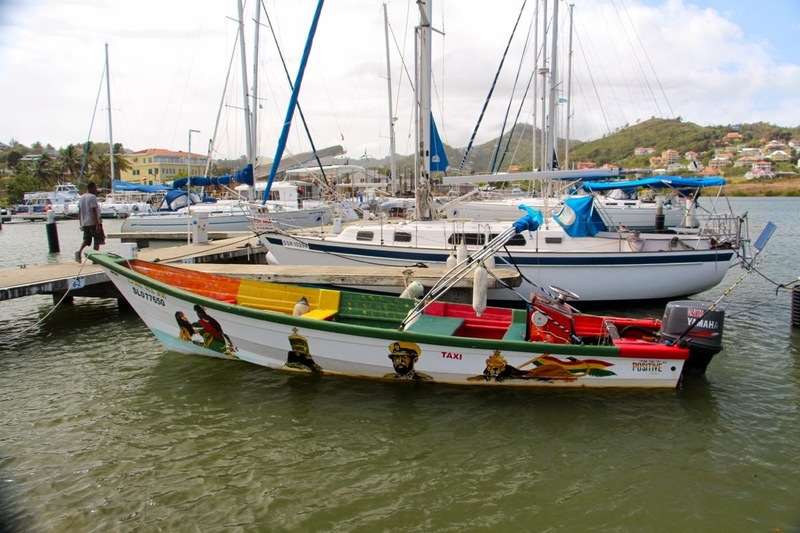 A local boat in St. Lucia. 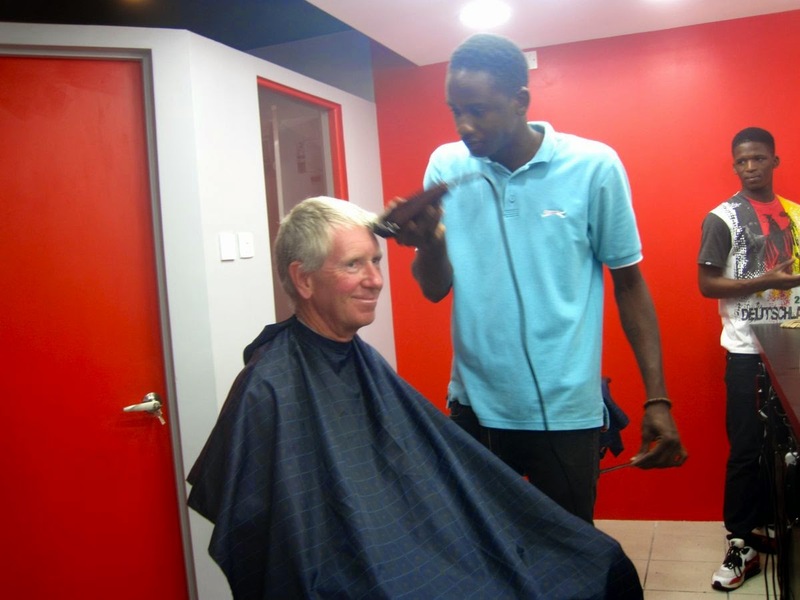 Ja lives! 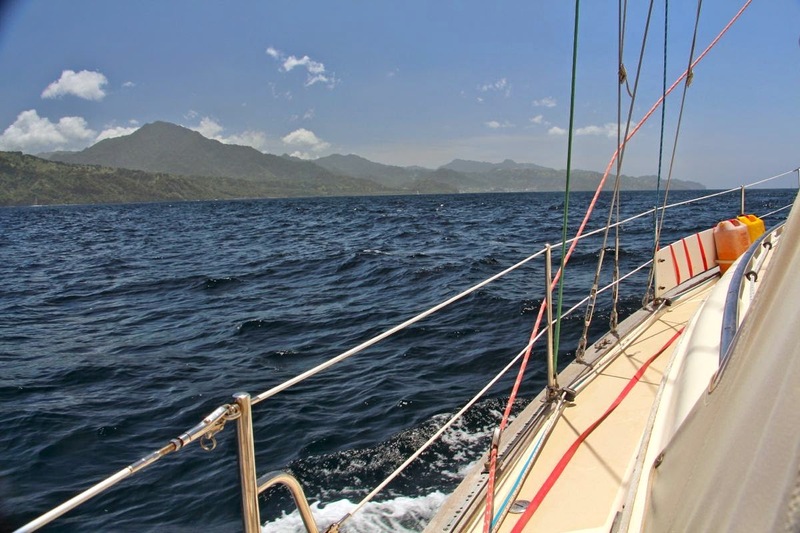 Sailing down the coast of St. Vincent. 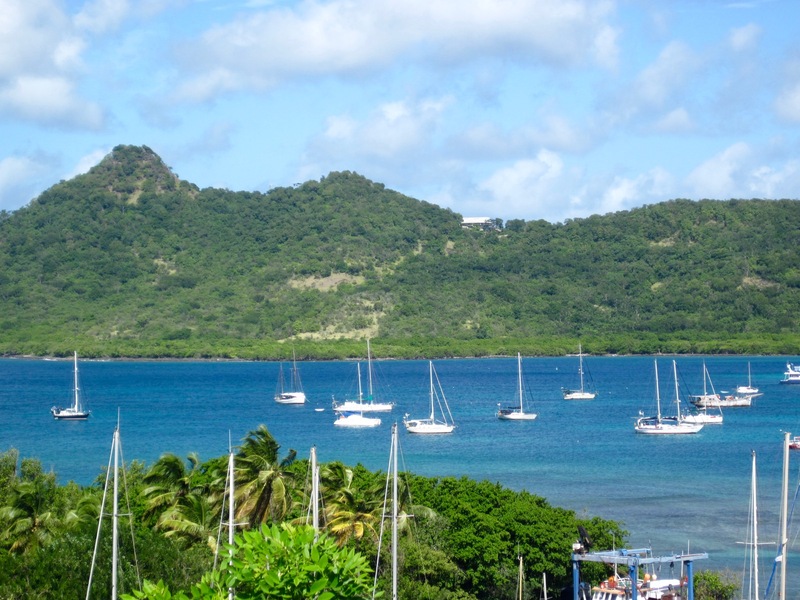 Bequia sees a lot of the classic sailing ships in Admiralty Bay, where we are. Just a typical breakfast of lobster and chocolate onboard Aspen - well not really typical. But lobster season is about to end so we had to support the fishermen! 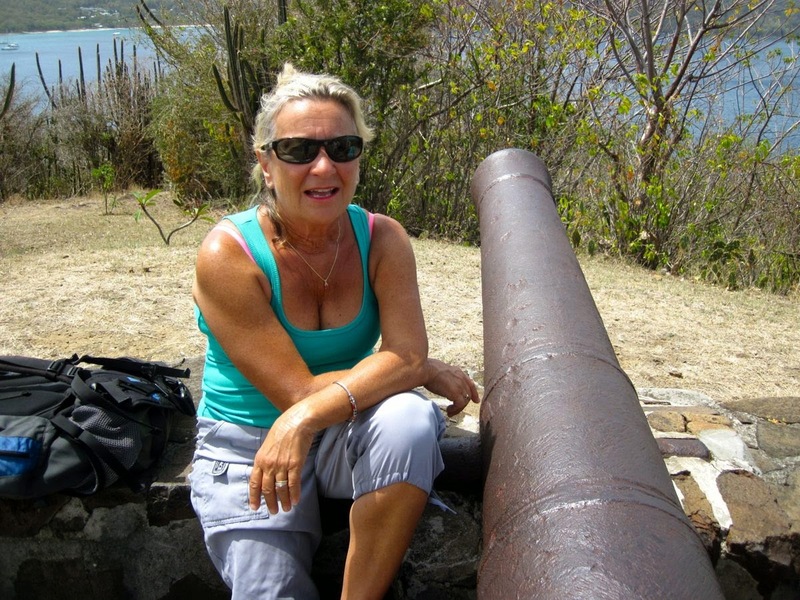 A cannon overlooking Admiralty Bay, Bequia. 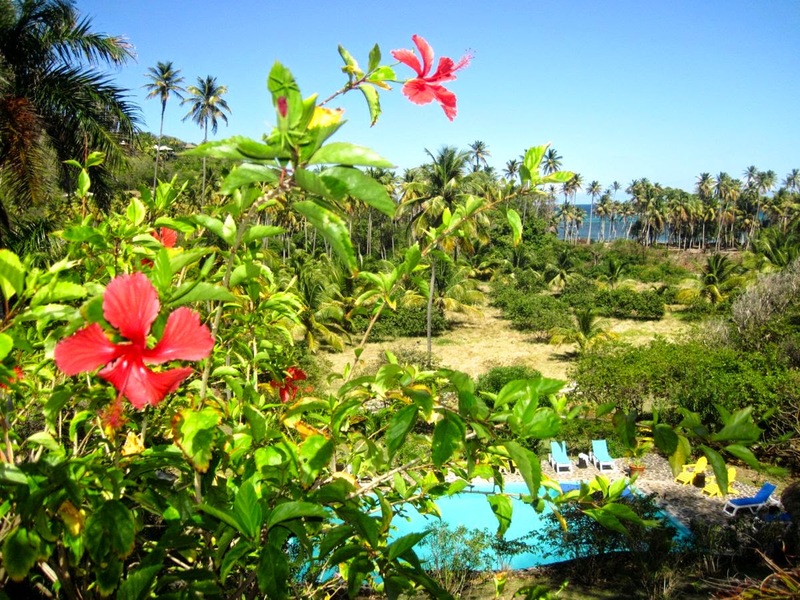 Bequia is very picturesque with the Frangipani tree blooming. Maria with Laurie and Pauline from Cat Tales under a nice arch. Steve admiring the geology of the arch. 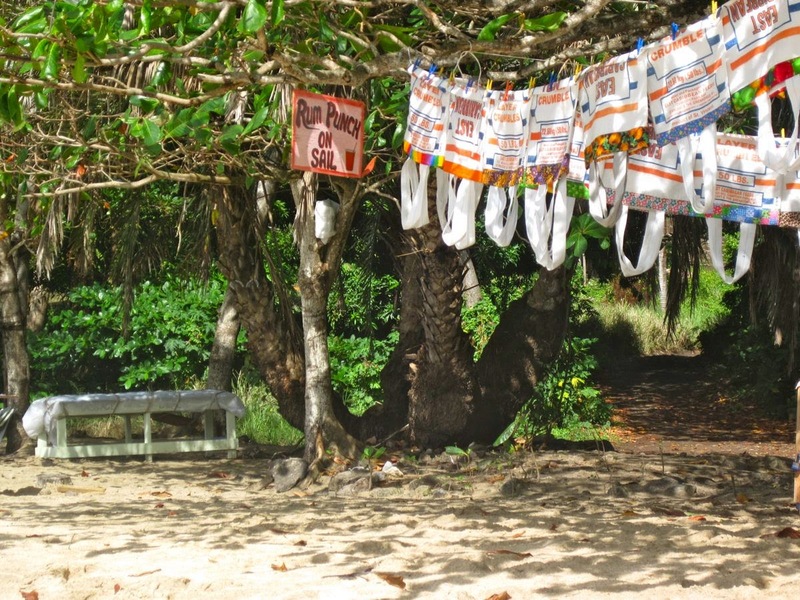 Don't you just love the signs on the Bequia beach? The bags are for sale too. Time passes ever so slowly in the tropics, once we are this far south. 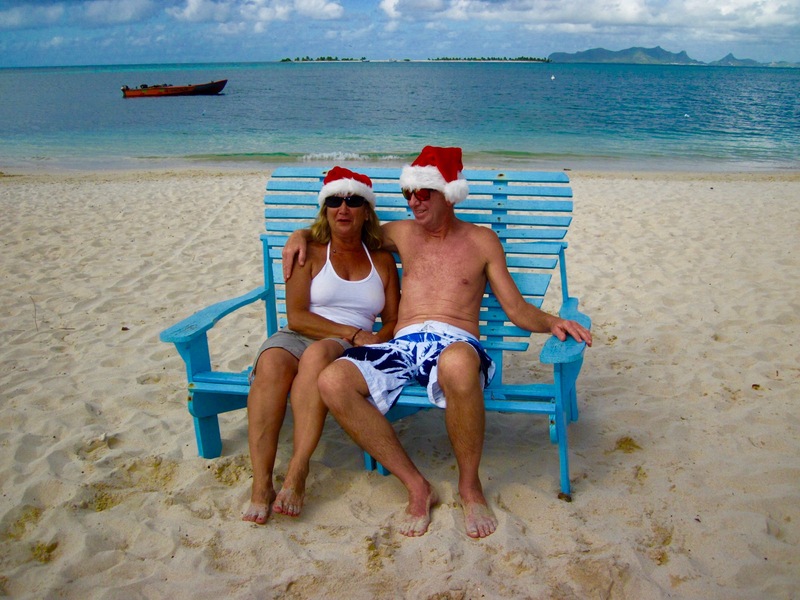 Life is easy sitting under the limin' tree in Bequia watching people parade along the beach next to the sea. 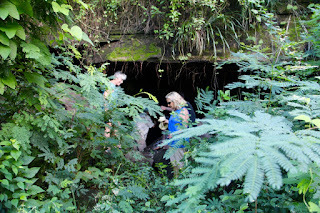 So where did we leave off last blog? 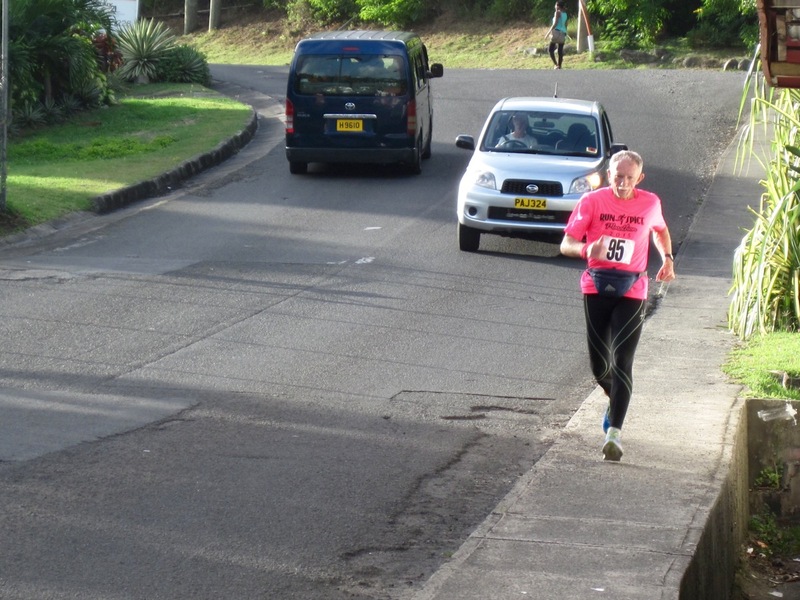 Ah yes, St. Lucia was welcoming us back once again. 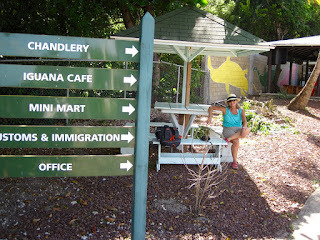 The place where we completed our trip around the planet was a delightful stop on our continuing journey south. 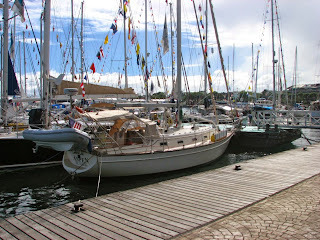 We went into the marina to refuel, recharge our batteries and refresh our minds with a secure place to stay. In doing so we avoided the French boats who like to anchor as close as possible to Aspen because they mistakenly believe our anchor rests in the absolute best place in an anchorage. 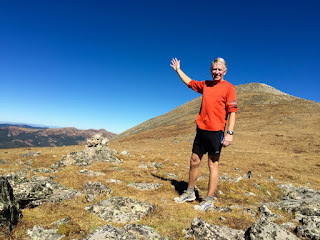 Being from Colorado and wide open spaces, we like to place Aspen in 5 acres of open sea without anyone coming into our protected space. But that isn't possible here so we endure boats swinging within mere feet of us most of the time. 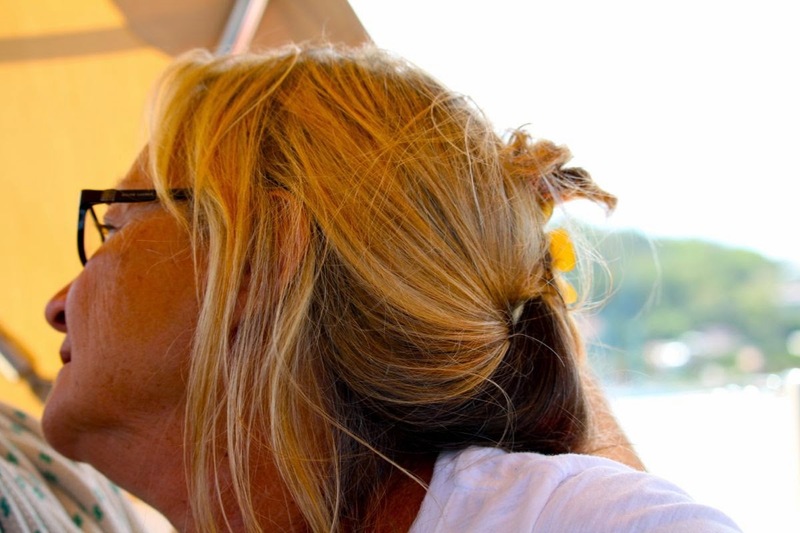 Oh well, it is a small price to pay in order to enjoy the sailing life. 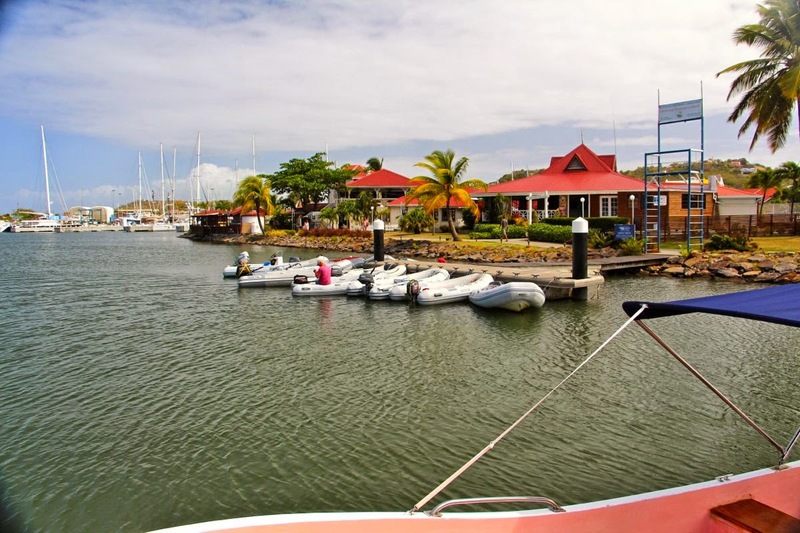 Once our stores of food, liquor and electricity were replenished we headed out to sea, turning to port with a fantastic weather window, sailing down the coast of St. Lucia and St. Vincent. An enormous humpback whale breeched a mere 1/4 mile away from Aspen, sending a wave of water nearly 20 feet into the air before diving deep into the deep blue Caribbean Sea off St. Vincent. 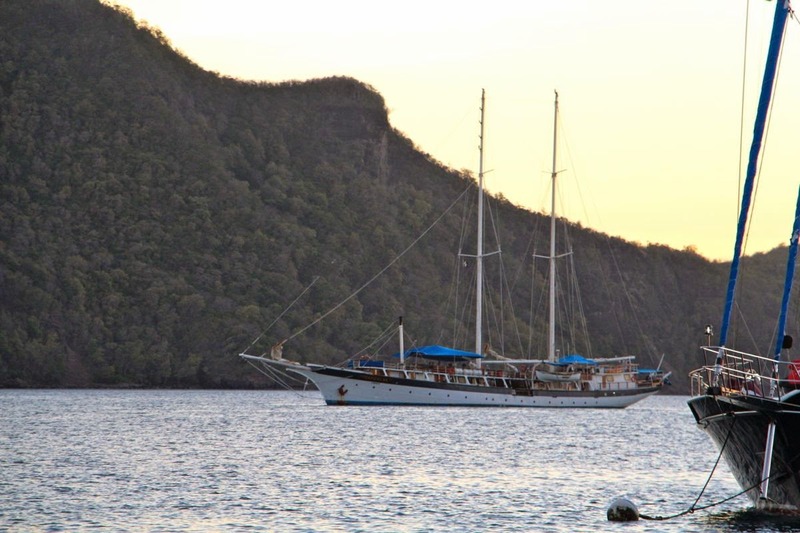 12 hours after leaving St. Lucia with our lovely sail, Aspen was safely anchored near Princess Margaret Beach on tiny Bequia, a cruising crossroads in the southern Caribbean. 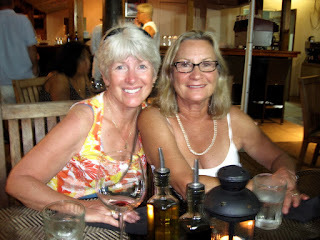 Bequia has changed since we last visited in 2009, like most places in the Caribbean. Progress marches on but luckily things move at a slower pace here. 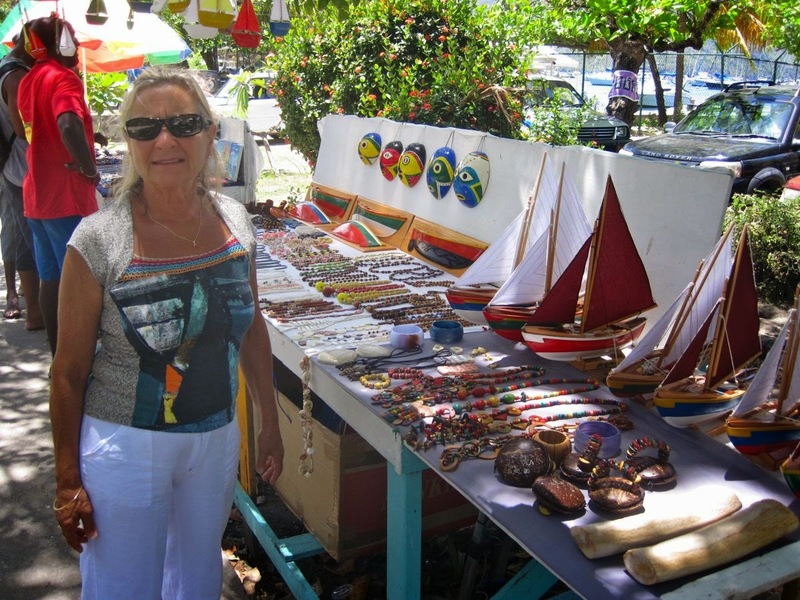 The vegetable market is still bustling with activity most mornings, as are the little shops lining the street through the village of Port Elizabeth on Admiralty Bay, our main anchorage in Bequia. Sailors wander through these streets looking for the usual things: groceries, lunch and rum (well sometimes beer, we have been told). 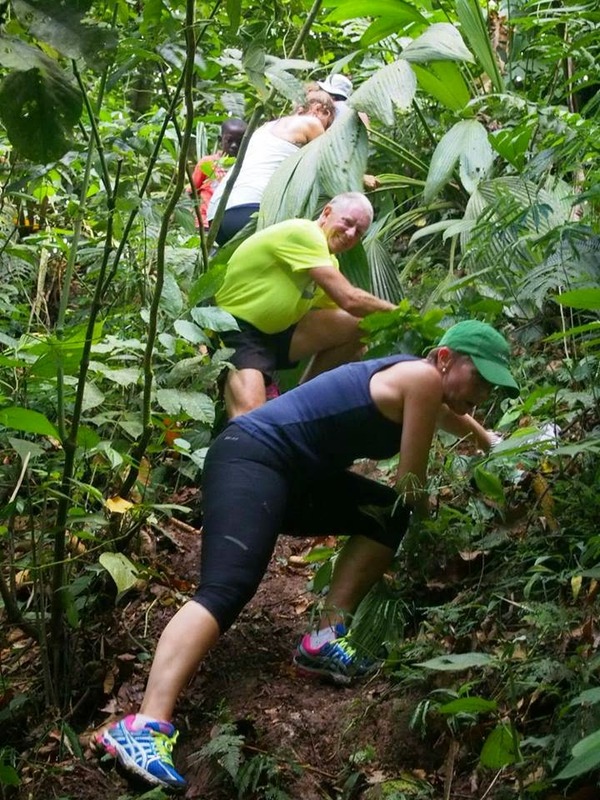 There are also nice hikes to take and view the sea from so many different vantage points, looking north to the mainland of St. Vincent and south toward the legendary Grenadines. Maria and I plan to spend a couple of weeks in Bequia before heading out. 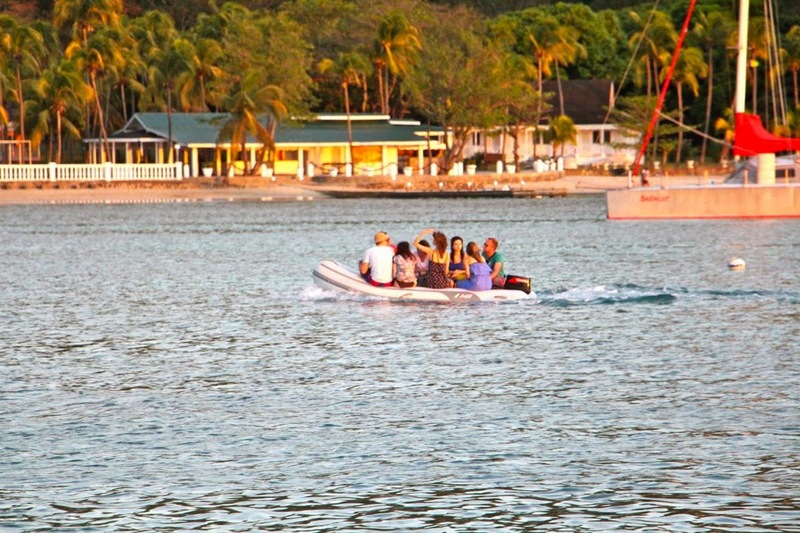 The charter boats keep us entertained as they arrive while the beaches glisten in the sun. 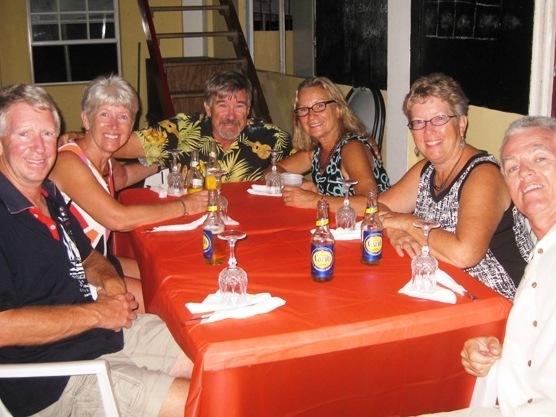 Besides, the annual Bequia Easter Sailing Regatta will happen so and we can't miss that! We heard the parties are not to be missed, oh, and there is sailing too. 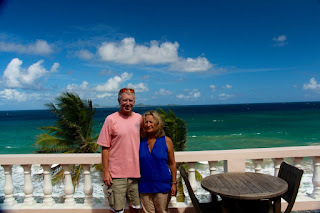 This time I put a video on our blog with a little song about Bequia. I hope you enjoy it. 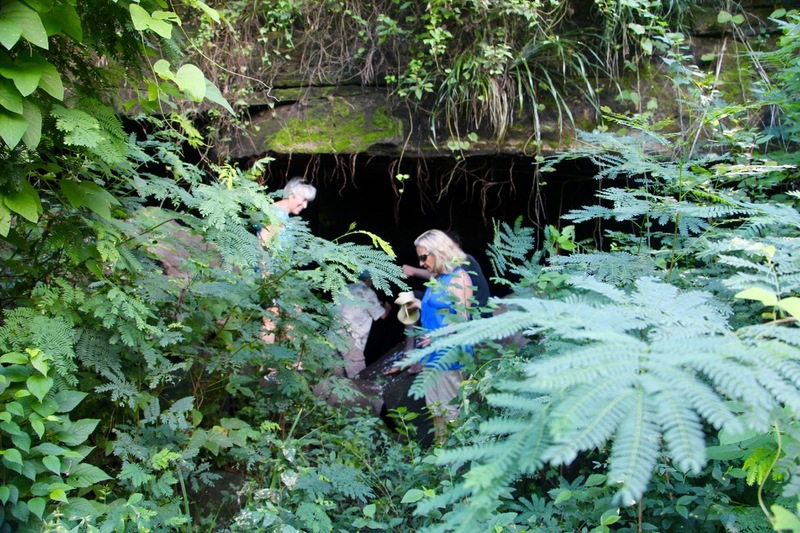 The book, Voyage Into Hell by Steve Siguaw can be found at Amazon.com too.